Diy skincare products are on the rise in popularity. Just look at Etsy under “beauty” and there is no limit to the amount of lotions, deodorants, shampoo bars, and lip balms to be had. Entire companies are now in existence for the sake of making and selling homemade, all natural skin care. There are many reasons to make your own beauty products and I’ll give you some of my favorite. When you make diy skincare products, YOU control the ingredients. If you want to avoid aluminum in deodorant, or you don’t like the SLS in shampoos, you no longer are forced to buy an alternative product. Making your own means you know what’s in there, and you can tweak the recipes to suit your needs. That deodorant recipe didn’t work? No problem, melt it down and start over and add different oils to it. That hair conditioner not your cup of tea? Not an issue for the budget, since you made it and the ingredients only cost a few pennies. Homemade skin care remedies means that you can do what’s best for you and your family. Get a wonderful soothing lip balm recipe here. When you make diy skincare products, you can customize with the change in seasons. If you get more chapped lips in the winter, you can make a different recipe of lip balm, adding in more almond oil or Vitamin E oil. If you tend to sweat more in the summer, making sure the homemade deodorant is up for the challenge is important. You can tweak the recipe in homemade deodorant to add more tea tree oil or sage in the summer when the heat is on. 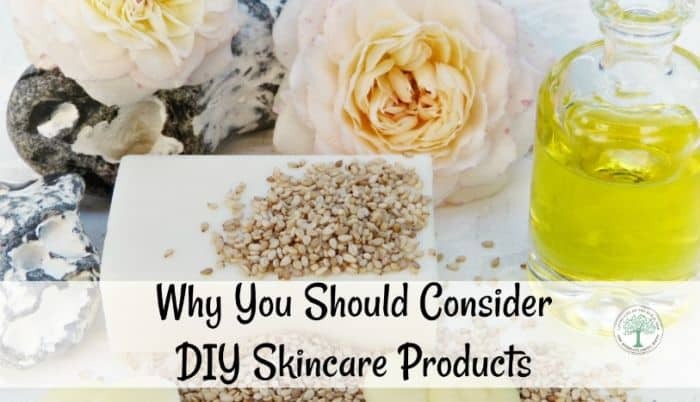 It’s easy to find ingredients for diy skincare products. You can grow chamomile or lavender for balms, rosemary for soaps and even forage for dandelions for shampoo bars. To read more on how to make your own deodorant, read the post here. Making DIY beauty products at home will make great gifts. Shower your friends with lightly scented soaps, lotions, shampoo bars, or bath salts. You can customize the scent for each individual, making them a truly unique gift. Add a cute basket, hairbrush or plushy hand towel to knock it out of the park! Having a few products on hand will make last minute gift giving less stressful, too. You can control the trash you make. Making your own skincare products means that you can reuse tins, balm containers and such. You no longer are buying single use items to toss away. Less trash is better all around, right? Do you make your own skincare? What is your favorite part about it? I started making my own soap because all the ones I bought made me itch. Now my whole family uses my soaps. I also make lip balms, sugar scrubs, body butter and lotions. Hoping when I get more space to work in to expand. Right now I live in a fifth wheel, lol.